AT&T cooperated closely with the NSA to facilitate spying, reports New York Times. 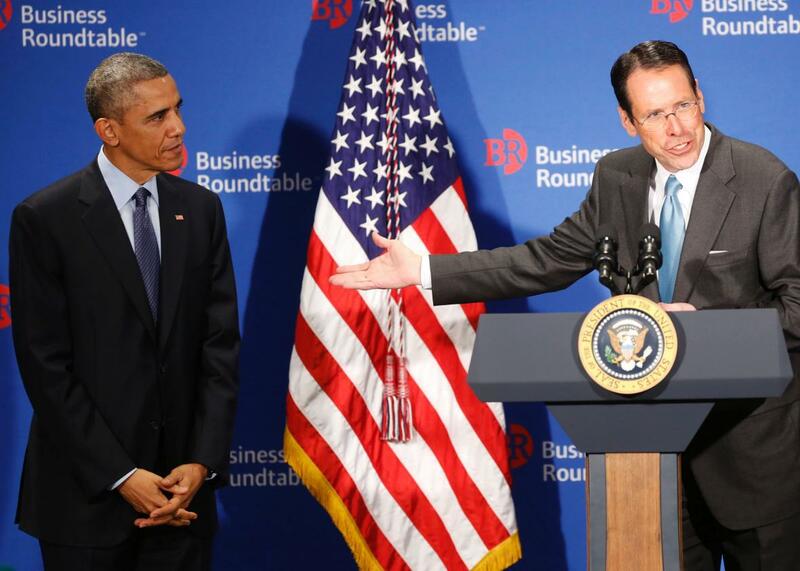 AT&T CEO Randall Stephenson introduces President Obama at the Business Roundtable on Dec. 3, 2014. The NSA’s extensive suite of tools and programs for large-scale digital surveillance is impressive (if sinister), but everyone needs help from friends sometimes. A report published Saturday in the New York Times, in partnership with ProPublica, examines documents from Edward Snowden that show AT&T’s involved relationship with the agency. The telecom’s “highly collaborative” attitude gave the NSA access to a large portion of United States Internet traffic. The NSA’s 2013 budget allocated more than double the money to its AT&T partnership than to the next largest corporate collaboration. AT&T has worked with the NSA on both the technical and legal fronts to carry out the agency’s goals, and after the Sept. 11 attacks, the telecom was at the forefront of compliance with warrantless searches and government metadata collection. AT&T has given the N.S.A. access, through several methods covered under different legal rules, to billions of emails as they have flowed across its domestic networks. It provided technical assistance in carrying out a secret court order permitting the wiretapping of all Internet communications at the United Nations headquarters, a customer of AT&T. The report notes that the Snowden documents only extend to 2013, so it’s unclear where the relationship stands today. The NSA also used codenames and vague references to describe its corporate partners, and never refers to any of them—including AT&T—by name. AT&T’s codename is Fairview, while Verizon’s is Stormbrew. The Times and ProPublica reporters drew conclusions based on extensive cross-referencing and contextual clues and then corroborated their theories with sources who once worked at the NSA. One gem from the documents is an instruction to NSA employees about being courteous to AT&T employees. “This is a partnership, not a contractual relationship,” the document says. Indeed!